but in terms of the details we offer 2 bedrooms with king beds, Smart HD TVs, Sound machines, fine hotel linens, plus 2 bathrooms. There is also an additional study/bedroom with a pull down Murphy bed. We designed the home to be an ideal blend of classic and contemporary - the residence features 12' ceilings, hardwood floors throughout and generous public room. The home also offers moderns amenities including three Ultra-Hi Def Smart TVs with cable and Wi-Fi throughout. Guests can enjoy sitting on the front or back porch, or hanging out in the rear yard with tropical plantings and our large Macaw bird named Rio! The Neighborhood: Located in the Lower Garden District on vibrant Magazine Street, this home is just steps to popular restaurants, coffee shops, local breweries and more. The home is three blocks from such as attractions as the Mardi Gras parades on St. Charles Avenue, the World War 2 Museum and the Ogden Museum of Southern Art. Additional nearby attractions include the New Orleans Convention Center, the Julia Street Arts District, Museum of Contemporary Art, the Children's Museum and multiple renowned restaurants.. Walking distance to Riverwalk outlet shops, Canal Street, and the New Orleans Superdome. The French Quarter is 12 walkable blocks away. Jesse is a longtime New Orleans resident, and has owned and operated The Green House Inn Bed & Breakfast (located directly next door to this home) for over 25 years. Sam is Jesse's close friend and the property's co-owner. While Sam is primarily located in San Francisco, he spends as much time as possible in New Orleans. This updated, solar powered home personifies all the charm and energy New Orleans has to offer. The location is truly one-of-a-kind with lots of personality and everything that you could need from local amenities, restaurants, arts, and parades. 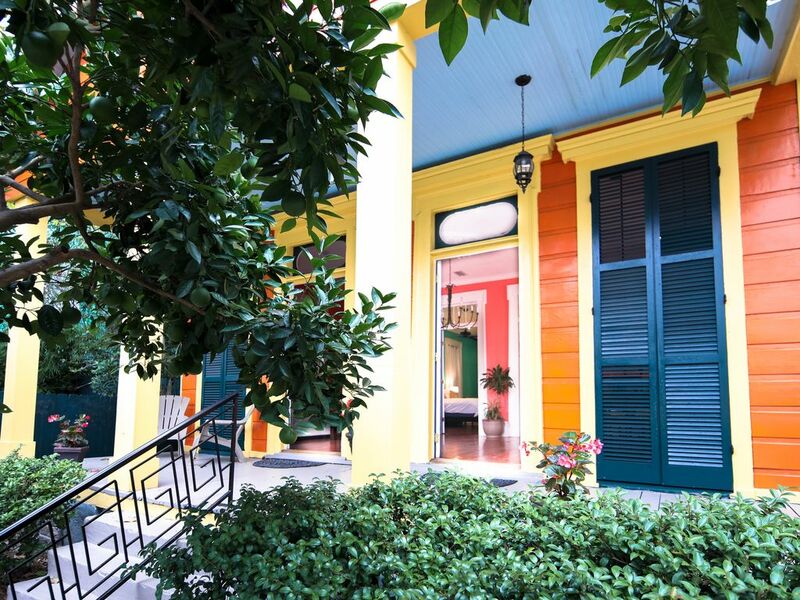 Located in the vibrant and hip Lower Garden District on famous Magazine Street. Parking is on the street, there is usually ample spaces available on Magazine Street or the side streets. A rental car is not necessary when visiting New Orleans. Commercial garage 3 blocks away. 6 burner commercial type stove, oven, microwave, Jen Air style refrigerator/freezer/icemaker, wine chiller, dishwasher, pantry, coffee maker, toaster, dishes and utensils, cook wear. Elegant glass and iron dining room table made by local artisan seats 6. 3 High Definition Large Screen Smart televisions with Cable. Guests may use there own streaming services. Guests may rent their own from rental shops very close to the house. Audubon Park is on Magazine Street with a public course. We loved the property, we loved the location. The backyard was awesome. A great trip all around. Thank you for letting us stay. We had an amazing trip. The house was perfect! Nice and clean. Good location. We had such a great time in this house. We were attending a convention, so the location was perfect. A little far if you want to go to the French Quarter, but not bad. We would stay there again. Location location location for the price, was spot on. Loved the location. Rio was very fun to watch as well. Would stay again & reccomend to others. We had a fabulous time staying here!! Sam was quick to respond with any questions we had. The house is very spacious, vibrant, and in a great location. Rio the macaw also made our stay very enjoyable! We would highly recommend! Great location for a family visit. We took a pre-Christmas trip to New Orleans for some family time with our teenagers. Communication with the owner was a breeze. The house was in a great location for us. We liked the neighborhood for walking, particularly down Magazine. There are some great shops and restaurants. The house itself was roomy enough for four of us. We enjoyed the secluded back deck and our time with Rio. We would definitely come back again. Truly one of New Orleans most sought after locations, the Lower Garden District offers an array of activities within easy walking distance. Magazine Street is known World Wide for its hip atmosphere, shopping and restaurants. The National World War 2 museum is only 3 blocks away. The French Quarter is 12 walkable blocks. The New Orleans Convention Center is 5 walkable blocks. St. Charles Avenue and its historic streetcar is 3 blocks, also the route of most major Mardi Gras parades. The Louisiana Super Dome is about 12 blocks. Both Tulane & Loyola University are about 4 miles and on the streetcar line.